Beagles & Hounds & Rescues, Oh My! 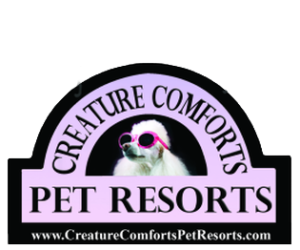 Lest the name Southern Arizona Beagle Rescue (SOAZBR) has you conjuring images of a desert Snoopy on top of his adobe doghouse, rest assured that, while this amazing group of folks takes Beagles, they also help hounds and hound mixes including Coonhounds, Bassett Hounds, and Beagles. They even occasionally lend a hand to other small breed dogs and have been known to help with Chihuahuas and other mixes. Fortunately, Beagles rarely end up in shelters in Arizona so SOAZBR focuses on educating people about the breed. 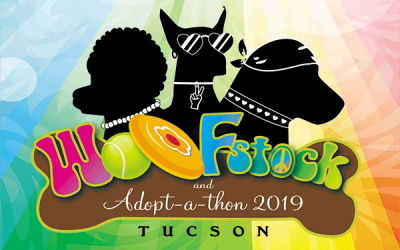 The organization relies on direct donations and adoption fees, which are all tax deductible, and they are always looking for foster home volunteers. SOAZBR is not only unique because they take in more than just their primary breed, but also because they have folks who adopt from them repeatedly. The high level of communication with adopters forms the basis of ongoing relationships that often outlive the dogs that start the relationship. A fun-loving group of people, the volunteers never miss a chance to get together with each other and their dogs to celebrate. The owners of Duchess and Chip have adopted from SOAZBR on four different occasions. They currently have Duchess, who is 14. Duchess was lonely after Sammy and Snoopy passed away, so her humans brought home Chip as her new partner in crime. Duncan and Sherman are Basset Hounds who were picked up as strays multiple times by PACC. Sadly, their original owner was just not able to take care of them. Both dogs were in rough shape when they came to SOAZBR. Fortunately, they are both now in wonderful homes! Brenda Suneson has rescued four Beagles and Bassett Hounds from SOAZBR. She always makes it a point to rescue the oldest or most in need. She has lost three dogs over the last two years because of that practice, but her love of dogs keeps her going. Currently, she has two dogs from SOAZBR: Bob The Beagle and Hank The Hound, formerly known as Duncan. Sherman went to Basset-loving adopters, who missed having their home filled with Basset love. They also adopted a Basset mix puppy from SOAZBR to play with Sherman. The two are inseparable; they love each other! When Gus the Beagle was pulled from PACC, he weighed 82 pounds when he should have weighed 40. As you might guess, he had multiple health conditions including hypothyroidism, severe periodontal disease, chronic dry eye (which requires a lifetime of expensive treatment), chronic ear infections, hot spots and other skin issues, and arthritis; all when he was only 7 years old. While SOAZBR was prepared to deal with his many health issues, his situation was overwhelming. It would have taken at least a year, and a lot of money to treat him. Fortunately, SOAZBR partners with Best Friends Animal Society; Best Friends agreed to take him into their program. Best Friends was able to successfully treat Gus’ many ailments. He even ended up requiring ACL surgery. After 14 months of extensive treatment and rehabilitation, Gus was finally adopted to one of Best Friends’ fantastic volunteers. Unfortunately, after only 6 months in his loving adopted home, Gus died of prostate cancer. Although the story has a sad ending, it highlights the beauty of rescues working together to help individual animals in need to get the loving care they deserve. Without the help of SOAZBR, Gus would likely never have received treatment or had the opportunity to experience his last six months in a happy home. Captain’s story is a great example of how many volunteers from multiple different rescues and different areas of the state came together to rescue one dog. 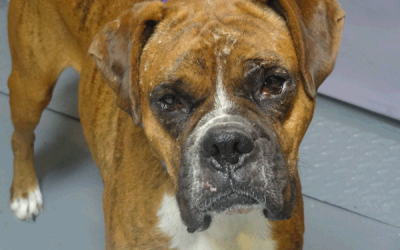 At least 10 rescuers and two rescues were involved in Captain’s adoption story. People from the San Carlos Apache Reservation helped with the rescue. Nancy Young Wright contacted SOAZBR, made sure Captain got to the vet, and coordinated everyone. Apache Jewel and fellow Globe Rescuers were the first to trap Captain, while Cheryl Naumann and her HARTT team trapped him the second time, after his escape. Local folks in Globe responded to the APB by keeping their eyes peeled for him, and Gila County Animal Control housed Captain until Carolyn Plemons transported him to Tucson, where both HOPE Animal Shelter and SOAZBR were on standby to receive him. Ann Haber, who herself has 6 rescue dogs, fostered Captain. SOAZBR eventually adopted him out to a great home in Tucson. His new family had previously adopted another Black & Tan Coonhound from SOAZBR. This amazing story shows the essence of teamwork involved in rescuing dogs. Captain’s new mom runs 5 miles with him 3 times a week; on another 3 days his dad walks him 5 miles. He gets more exercise than the average dog, for sure! Captain lives with his mom, dad, a Black & Tan Coonhound brother, and 3 human teenagers. He has a huge Alcatraz-like yard, runs and walks on a secure leash/harness system, and he has 3 ID tags and a microchip. The family plans to never let him escape, but it seems that Captain no longer has reason to run away from his loving home. 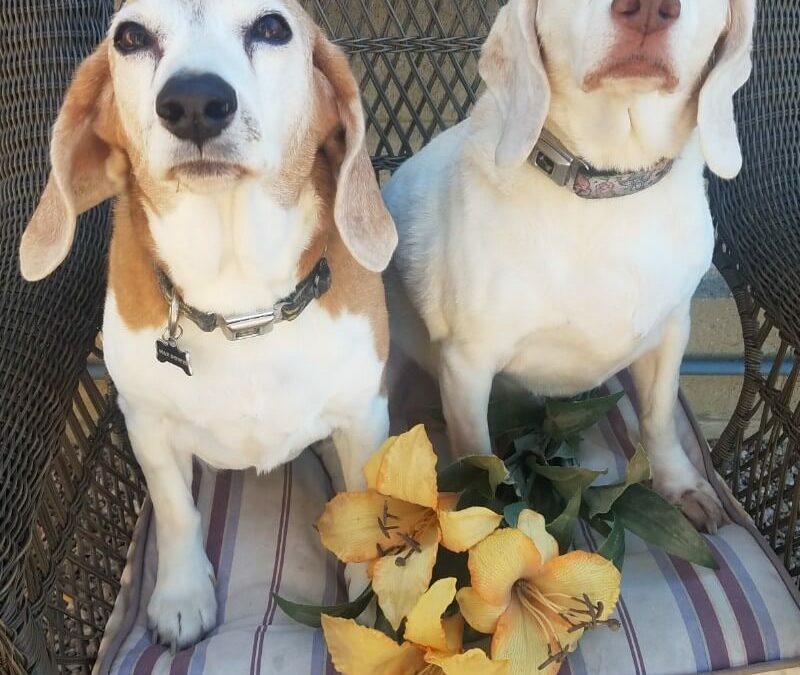 SOAZBR currently has two bonded senior Beagles in foster care, awaiting their forever home. They are this issue’s cover model dogs, Jaina and Max! Could you be Max & Jaina’s new fur-ever home? Spread the word, and let’s get these wonderful pups a perfect home for their golden years. 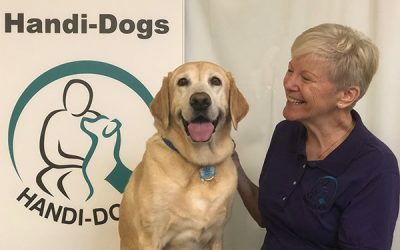 It’s Handy to Have A Dog: Handi-Dogs Saves The Day!